When we first saw them, they looked like big boulders all over the huge area. But when they heard our voices and saw us, it was action time. One after the other each one came up to us as fast as their big stump-like legs could bring them. And we were shocked at their reaction. But what followed amazed us even more. 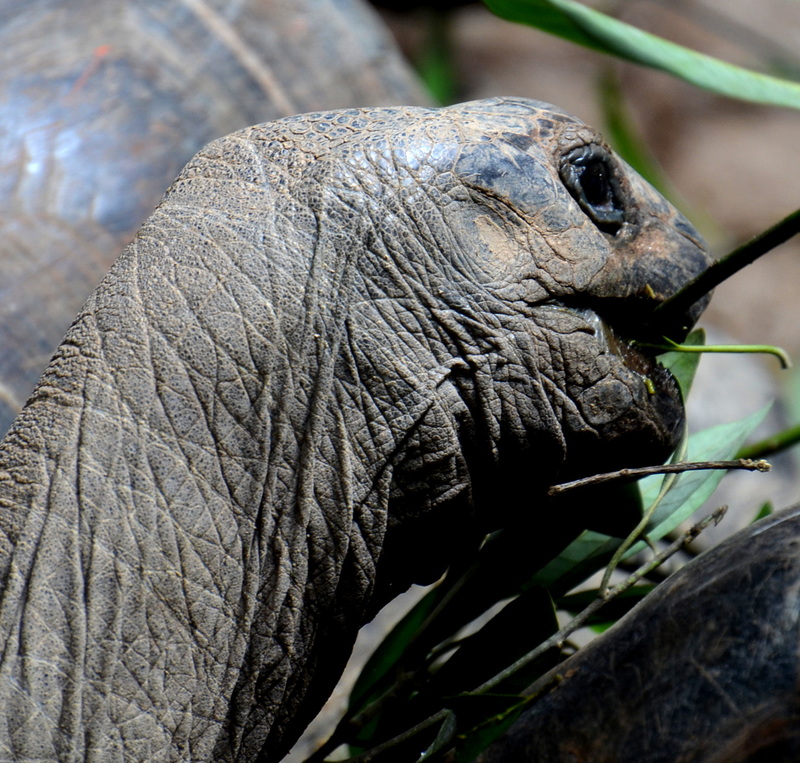 We had no idea the giant Aldabra Madagascar tortoises even moved. 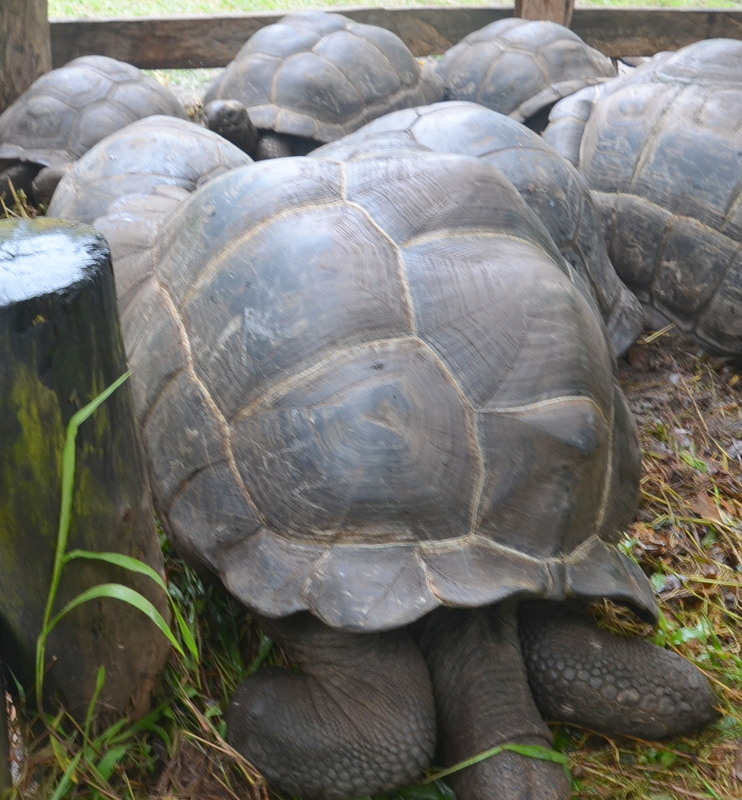 The giant tortoises of Galapagos just stood still and watched us when we visited them. 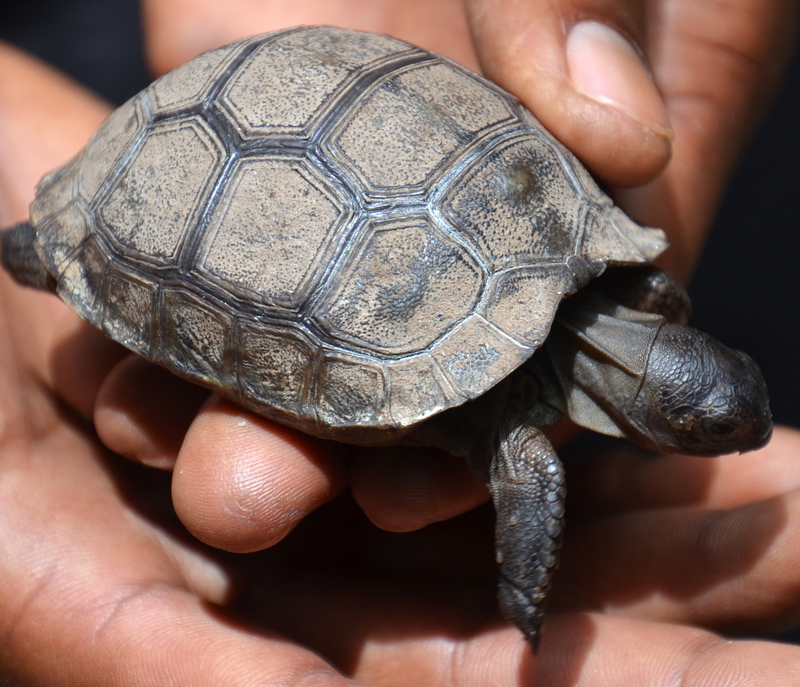 But on the Indian Ocean Island of Rodrigues in the Francois Leguat Giant Tortoise and Cave Reserve, they were ready for action. 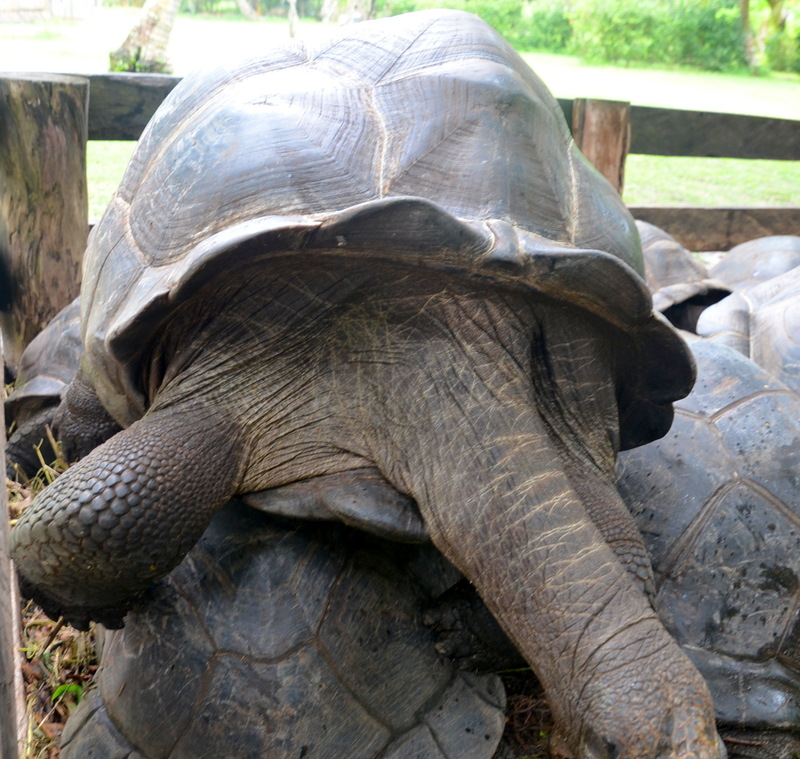 These giant tortoises wanted to be petted, rubbed, massaged and loved and they didn’t want us to stop. So when we did stop, they followed us wanting more. It was like a personal relationship with a puppy. But they weren’t warm and fuzzy like a dog. Their necks and heads were cold, very dry and scratchy. It was like rubbing fine sandpaper. But we didn’t mind massaging them because they just loved it and showed us that they did by being totally still except for blinking those big eyes and eyelashes. It was enjoyable to us as much as it was to them. 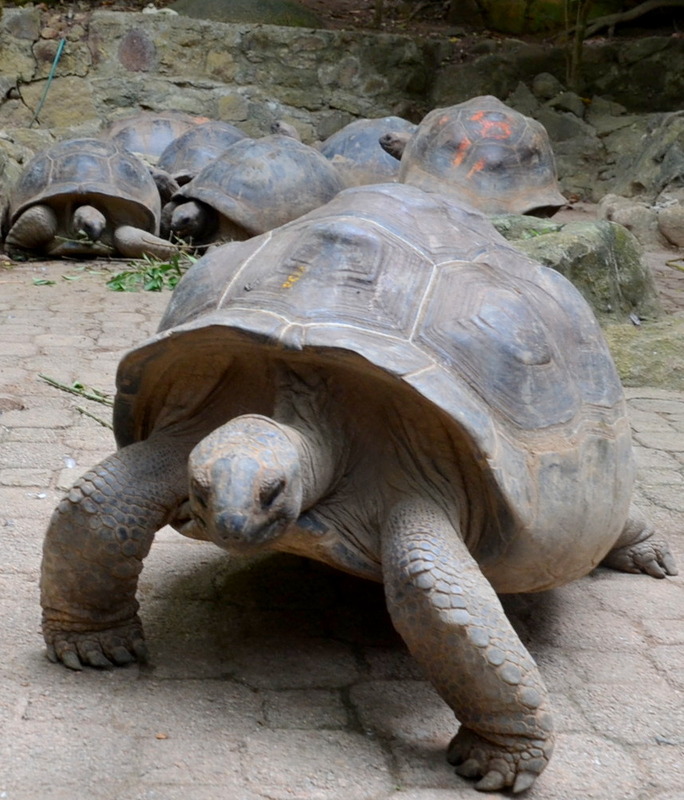 Several of the giant tortoises were around us at all times competing for attention. One wanted to be petted so much he started climbing on me by raising his huge foot right on top of my foot. That big foot was heavy and the weight hurt. I knew giant tortoises weighed a lot but never realized it until I was stepped on. I tried pulling my foot out from the tortoise’s foot to no avail. Finally after wiggling it back and forth, I succeeded and my foot was free. But the tortoise still wanted a massage so I gave it one. 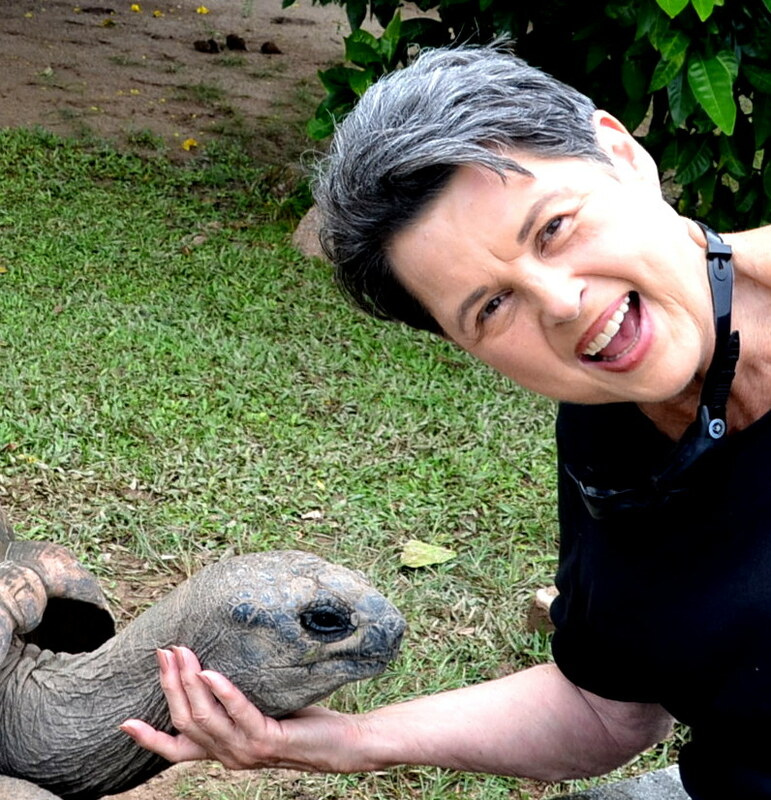 It was a GIANT tortoise celebration for my birthday and the choice of an experience with them in the Seychelles was a one-a-kind experience and total enjoyment surprise. Our next tortoise encounter occurred on the Seychelles island of Moyenne. 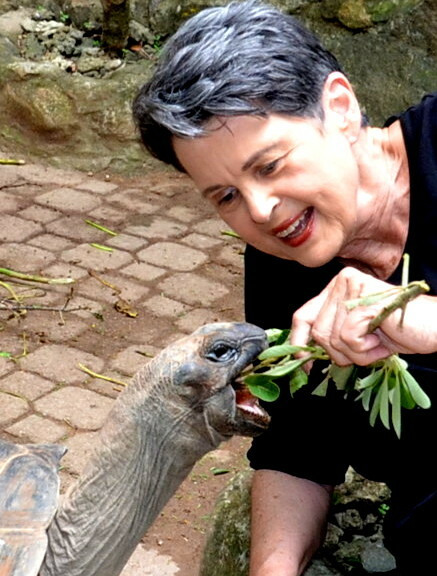 There we could even feed the giant tortoises a snack and it was so exciting seeing them open their huge mouths for food. With a soft twig full of leaves, we set out to treat one that was just waiting patiently nearby. It opened that big mouth showing its big pink tongue and big white teeth. And the next thing it did was grab that leaf snack right out of my hand. It was so rewarding to watch it chew those leaves with those big eyes and eyelashes flashing enjoyment. Then branch after branch was enjoyed until several of the other 12 tortoises wanted their share too. It was a fulltime fun snack feeding encounter on one of the 115 islands of the Seychelles. 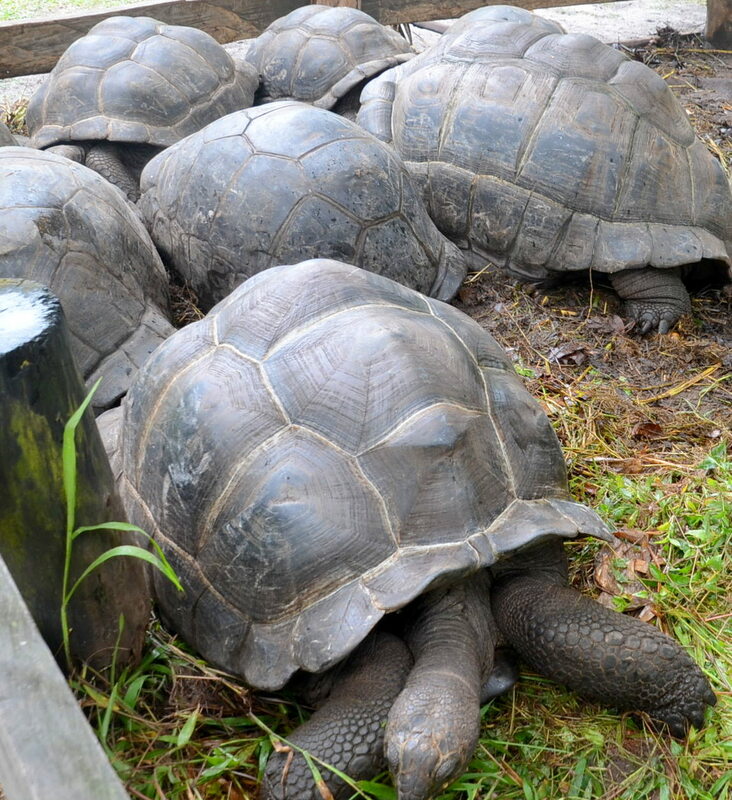 The grand finale on Moyenne Island was getting to see and hold a just-born giant tortoise. It fit into our hand just perfect but its legs were going full speed trying to escape. So it was taken back to its pen where it was born. 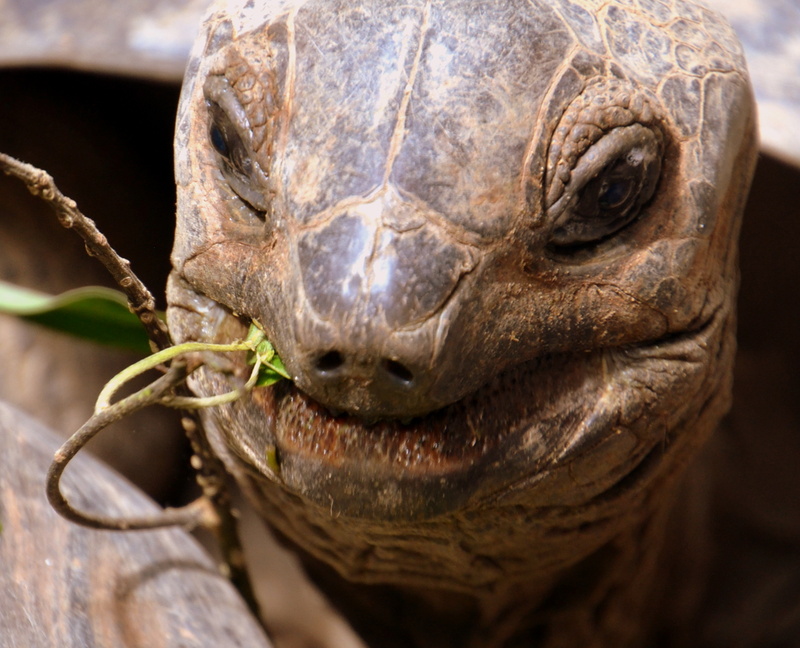 It was on Praslin Island, Seychelles’ #4 most beautiful beaches in the world, that we enjoyed our third visit with giant tortoises. Here, were 12 tortoises all enjoying banana stalks at the same time while being jammed in a corner. One wanted out of the pile of tortoises but just couldn’t make it. Little by little, it rose up and finally made it enough to get on top of another tortoise. Shells were clacking and rubbing together and the tortoise on top was dangling vicariously trying to get some movement off of center. It tried and tried and tried to get down and finally, it happened. That tortoise landed on its 2 front feet with its head making a sturdy triangle support and it finally had freedom from the mob of tortoises. 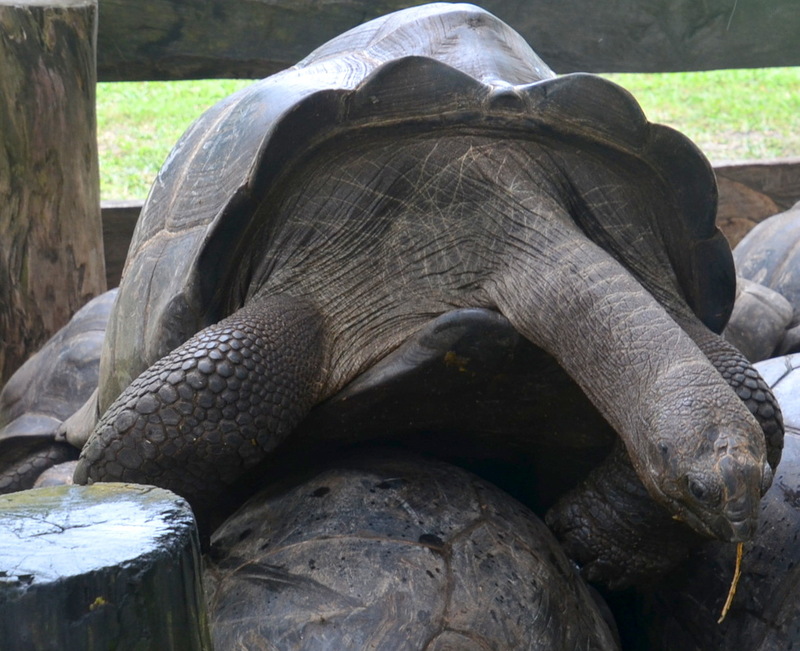 Our fourth adventure with the giant tortoises was at the La Reservoir Hotel and Spa when we went for lunch again on the Seychelles’ Praslin Island. Walking towards the restaurant, we passed a large area with those big tortoises. And as they heard and saw us, one made it over to me as fast as possible. And it was wanted a massage. Like all the others, it thoroughly enjoyed the petting. It even tried to climb the wall to get closer for more massages. But the restaurant was waiting for us, so we left the petting reluctantly. As we returned to our hotel, I noticed a wooden giant tortoise souvenir in a shop on the side of the road and just had to stop the see it. I liked it, asked the price and as I did an old man came waddling over from front yard to the shop. 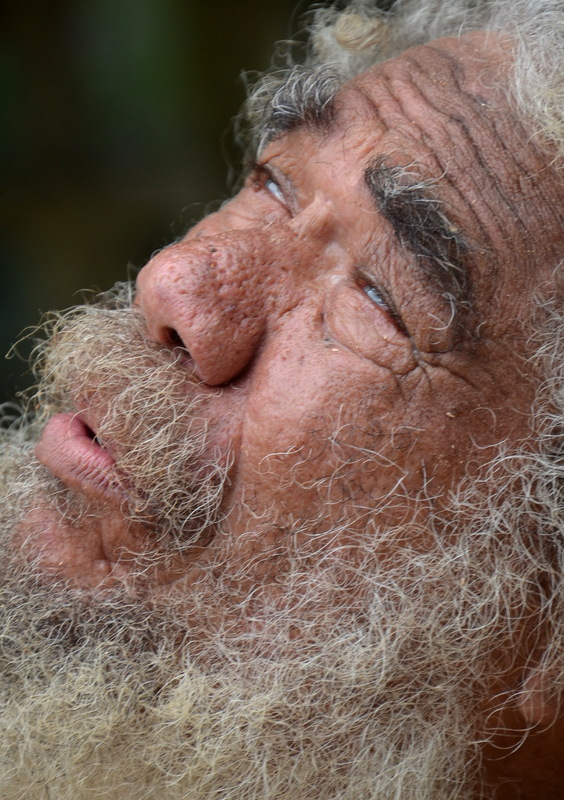 “It’s $10,” he said, “and I am Frances Powl, a fisherman who has fished all over the world.” With his introduction to us, we knew we had a one of-a-kind character from Praslin Island. 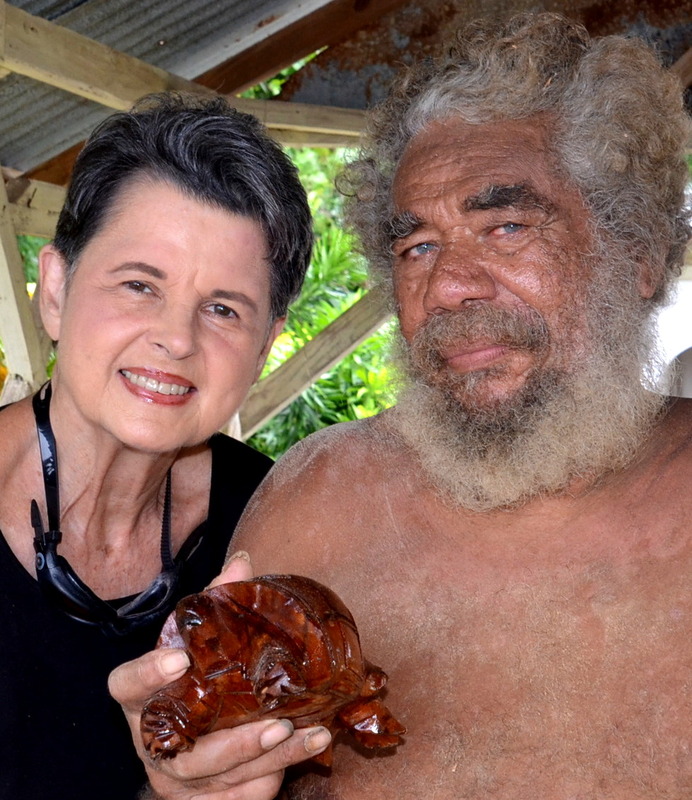 He declared that he had hand carved that giant tortoise by himself and that I should treasure it forever. As we waved goodbye, he continued with his fishing tales and prayed for continued wellness as he looked up to the heavens. Then he thanked us for buying the tortoise and wished us happy voyages all around the world. So that hand carved giant tortoise will remind me of the many encounters and fun I had with the Aldabra Madagascar giant tortoises in Rodrigues and Seychelles Islands. Petting them and seeing them react to it was such a surprise and giving them a snack was even more rewarding. We are certain that they await our return to their island for more massages, loving, rubbing and snacks for each one loved it so much and followed us for more when we stopped. They can live for hundreds of years and we hope they receive many massages, snacks, loving and rubbing from visitors so they can live those years in happiness.